Woodsman 1st Series Sport .22LR 4.5" Blue, 99%IB, SN#182767 (1947) RARE Pre-War/Post-War tapered barrel model with correct mint original Coltwood (plastic) grips left over from the Bullseye Match Target military contract, correct original mainspring housing for high speed ammo, correct blue magazine correct fixed trapezoidal front sight , mint bore, in way above average correct RARE oversize box (for the longer grips) numbered to gun with end labels intact and rare boxtop label detailing the plastic grips, correct original instruction manual and original hex-handled sight adjustment tool. All markings correct. 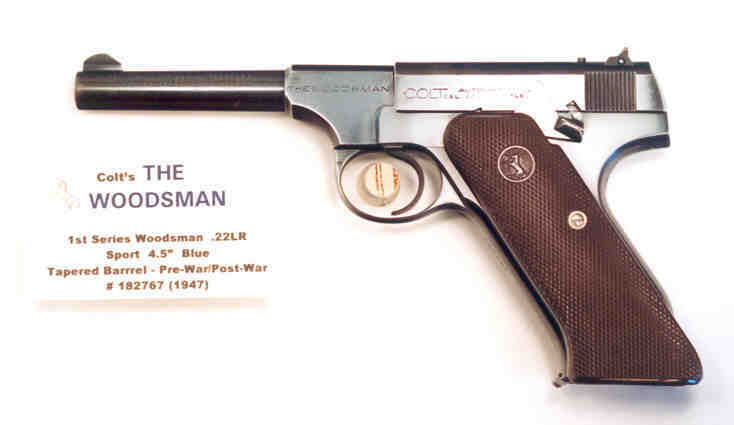 Gun was made after WWII from parts manufactured before WWII and correctly features the high gloss (almost black) blue finish that appeared on the 2nd Series Woodsmans starting 1947. 1985 Factory letter to Major Robert Rayburn who had it in his collection at that time. Pre-War/Post-War Sport model is exceedingly rare with original oversize box!